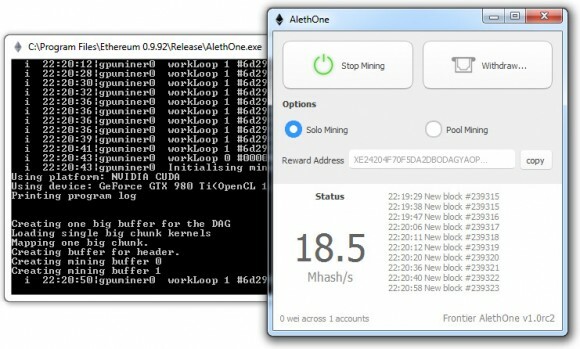 The C++ implementation of the Ethereum client (cpp-ethereum) is getting more user friendly with the new AlethOne GUI intended to simplify the mining process for users that are not into programming and hate to use console-based software. The AlethOne GUI is going to be a part of the eth client, though currently it is only available in a release candidate form and it will be interfacing with the eth client. The first time you run the GUI it will ask you for a password and will generate an Ethereum wallet address, then start synchronizing the blockchain. The good thing is that AlethOne presents the user with a simple interface and reports in an easy to read details about the functionality of the eth client in the backend such as the Ether balance you have or the blockchain synchronization status or even the hashrate when mining. As for the mining you get an easy option for solo mining or pool mining with a field to enter the pool URL to mine at and after you have mined some coins you have the option to easily initiate a transfer to another account. So far the latest release candidate of AlethOne looks quite nice and works decently, though there are apparently some more things that need work before the final release is available. For example it seems that the mining is only working on the first GPU and if you have multiple video cards that you want to mine with there is no way to tell the miner to use them all form the GUI apparently. The Withdraw functionality also needs some more work in te form of any feedback returned in the AlethOne GUI regarding the execution of the transaction such as if it was successful or not etc. Regardless things are already looking good and the AlethOne GUI with some more improvement and fixes is definitely something that Ethereum needs in order to become easier to be used by not so advanced users – basic wallet and mining functionality in a streamlined desktop client.